Ebola: Are We Prepared for Recurring Infectious Threats? Cancer patients undergoing chemotherapy treatment are advised to increase food intake to overcome the therapy-induced side effects, and weight loss. Dietary restriction is known to slow down the aging process and hence reduce age-related diseases such as cancer. Fasting or short-term starvation is more effective than dietary restriction to prevent cancer growth since starved cells switch off signals for growth and reproduction and enter a protective mode, while cancer cells, being mutated, are not sensitized by any external growth signals and are not protected against any stress. This phenomenon is known as differential stress resistance (DSR). Nutrient signaling pathways involving growth hormone/insulin-like growth factor-1 axis and its downstream effectors, play a key role in DSR in response to starvation controlling the other cell maintenance systems, such as autophagy and apoptosis, that are related to the tumorigenesis. Yeast cells lacking these effectors are better protected against oxidative stress compared to normal cells. In the same way, starvation protects many cell lines and mice against high-dose chemotherapeutic drugs. According to a series of studies, fasting results in overall reduction in chemotherapy side effects in cancer patients. Data shows that starvation-dependent differential chemotherapy is safe, feasible and effective in cancer treatment, but the possible side effects of starvation limit its efficacy. However, further studies and clinical trials may result in its implementation in cancer treatment. Objectives: To compare glucose values obtained using sodium flouride (NaF) tubes and serum separation tubes (SST) in a tertiary care hospital laboratory setting. Methods: This study was conducted at the Clinical Biochemistry Laboratory, Royal Hospital, Oman. During the study period (1 September–30 November 2013), 50 pairs (one NaF tube and one SST) of patient’s blood specimens were randomly collected. Following separation of plasma (NaF tubes) and serum (SST), glucose concentrations were measured by hexokinase assay using the Architect c8000. Fifteen pairs of these tubes were kept in the refrigerator at 4°C and plasma/serum glucose concentrations were measured daily up to seven days after collection. Results: Comparing plasma (NaF) and serum (SST) results of glucose values (n=50) showed an average difference of 0.00mmol/L (range -0.60 to +0.60mmol/L). Bland Altman analysis gave a non-significant constant bias of 0.10 ±0.195mmol/L (bias ±SD). Pearson correlation between plasma (NaF) and serum (SST) glucose concentrations revealed a significant correlation approaching unity with r2= 0.9991. No significant differences in glucose values were noted for both plasma and serum in 15 pairs of NaF and SST tubes when analyzed seven days following refrigeration. Hemolysis was observed in five (10%) NaF tubes compared with two (4%) SST. Conclusion: There is no difference in glucose values collected from plasma NaF tubes or serum SST, and so SST can be used in hospital laboratory settings as there are practical advantages, including cost-effectiveness and reduction in blood volume drawn when utilizing these tubes for glucose and other tests from a single blood collection tube. Objectives: Our study aimed to analyze the clinical presentation, management, and outcome of renal angiomyolipoma patients incidentally detected upon computed tomography (CT) examination. Methods: Between 2004 and 2008, all patients who underwent abdominal CT examination for any reason at the radiology department at Hamad General Hospital, Qatar were retrospectively reviewed. The diagnosis of renal angiomyolipoma was based on abdominal CT evaluation. Angiomyolipoma patients were followed-up by CT evaluation as per standard care for three years to observe any change in size and outcome. Results: A total of 13,115 patients were screened, of which 56 (40 females and 16 males) had renal angiomyolipoma. The mean age of patients was 52±13 years with 46% Qatar nationals. The majority (95%) of cases had unilateral tumors (52% right-sided and 43% left-sided). Twenty-six cases showed increase in tumor size and the median increase was 0.5cm (0.1–3.6). Surgical intervention was required in four (7%) cases with tumor size ≥4cm. The overall mortality on follow-up was 7%. The cause of death included metastasis, renal failure, hepatic failure and mesenteric thromboembolism. 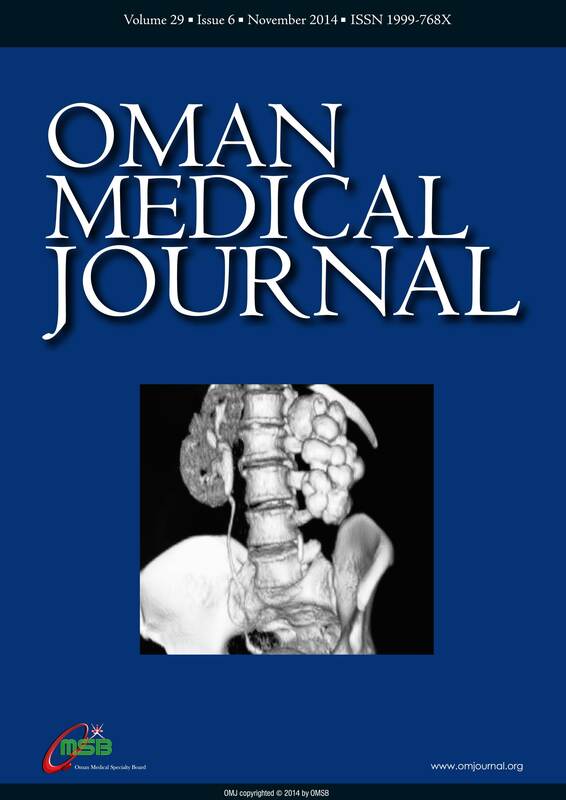 Conclusion: Renal angiomyolipoma is an uncommon benign tumor with an overall prevalence of 0.4% in Qatar. It has characteristic clinical features and its recognition is often challenging for proper clinical diagnosis and treatment in asymptomatic patients. Asymptomatic patients need regular radiological surveillance. In contrast, surgical interventions are mainly required in symptomatic patients with increased tumor size (≥4cm). Timely diagnosis and treatment is necessary to avoid complications such retroperitoneal hemorrhage and renal impairment. Objective: To evaluate the effect of LI4 acupressure on labor pain and duration during the first stage of labor. Methods: Parturient women (n=149) with singleton pregnancies in the active phase of spontaneous labor, without any medical or obstetric problems, were enrolled in this single-blinded, randomized, clinical trial. Participants were placed into one of three groups: an LI4 acupressure group, a touching group, and a control group in which no pharmacological or non-pharmacological methods of pain relief were used. Pain intensity was measured by visual analog scale before and after the intervention in the first stage of labor. Pressure or touch was applied for 30 minutes during uterine contractions. Results: The difference in the pain scores between the acupressure and control group was statistically significant (p<0.001) but there was no statistically significant (p=0.942) difference in the duration of the first stage of labor between the three groups. Conclusion: Acupressure is an effective, non-invasive, and easily applicable technique to reduce labor pain. Objectives: The aim of this study was to explore different psychosocial impacts on Omani women diagnosed with breast cancer. Methods: Semi-structured individual interviews were conducted with 19 Omani women diagnosed with breast cancer to describe the impact of the disease on their personal and social life. Women were recruited from wards and out-patient clinics at the Sultan Qaboos University Hospital, Muscat. Results: Four main themes emerged. These were: a) factors related to psychological distress of the disease and uncertainty (worry of death, interference with work and family responsibilities, searching for hope/cure, travelling overseas); b) reactions of family members (shocked, saddened, unity, pressure to seek traditional treatments); c) views of society (sympathy, isolation, reluctant to disclose information); and d) worries and threats about the future (side effects of chemotherapy, spread of the disease, effect on offspring). Conclusion: Breast cancer diagnosis has several devastating psychosocial impacts on women in Oman. Healthcare professionals working with women with breast cancer should be aware of the different psychosocial impacts of the disease on women’s lives. Appropriate measures must be taken by the decision makers whenever needed, including enforcing positive views and support of Oman’s society towards women with breast cancer. Keywords: Breast cancer; Diagnosis; Oman; Qualitative research. Pulmonary Alveolar Microlithiasis (PAM) is a rare disease of unknown origin. It is characterized by the presence of small calculi within the alveolar spaces, and has various clinical manifestations. Some patients may be asymptomatic for a long period of time with subsequent occurrence of dyspnea, dry cough, chest pain, and eventually, respiratory failure. Recurrent spontaneous pneumothorax episodes are a late complication of the disease. We report the case of an alveolar microlithiasis episode in a 42-year-old male, admitted to Tohid Hospital, Iran, whose first clinical presentation was symptoms of pneumothorax. He was admitted with sudden onset dyspnea and right-sided pleuretic chest pain. Following treatment of pneumothorax after chest tube placement, the pulmonary function revealed normal indices, and chest radiograph demonstrated diffuse confluence of dense micronodular infiltrate. High-resolution computerized tomography scan showed diffuse ground glass attenuation and calcifications along the interlobular septa and subpleural regions. Transbronchial lung biopsy confirmed the diagnosis of PAM. Sister Mary Joseph’s nodule refers to palpable nodules bulging into the umbilicus as a result of metastasis from malignancy in the abdomen or pelvis. The most common primaries are in the gastrointestinal or genital tract, while other origins are considered rare. We recently treated a 71-year-old man who presented with painless umbilical swelling. Further investigation, including laboratory, radiological and histopathological exam, confirmed the diagnosis of a metastatic neuroendocrine tumor. The peculiarity of this case is that the umbilical swelling was the initial presentation of a neuroendocrine tumor and, to our knowledge, this is the first to be reported. This case demonstrates that neuroendocrine tumor is a rare cause of Sister Mary Joseph’s nodule.